Senpou Temple, Mt. 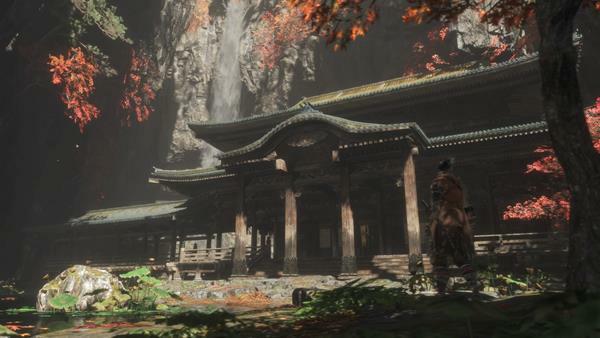 Kongo is a Location in Sekiro: Shadows Die Twice. The Senpou Temple of Mount Kongo is no longer the holy grounds it used to be. The monks have been corrupted by their desire for immortality, and the Buddha grieves. Senpou Temple, Mt. Kongo is accessed via the Abandoned Dungeon, by taking a lift after swimming past the Underground Waterway Idol. As you arrive, commune with the Senpou Temple Idol to unlock the location for respawns and travel. A voice will call to you to look upon the enlightened face. When you interact with it, you'll learn that the monks of the temple have abandoned their duties in pursuit of immortality, and the area has become perilous. As you exit the idol's housing, turn left and go around the corner to find 1x Gachiin's Sugar. Now go the opposite way (right from the exit) and you'll spot another item. This is 1x Scrap Iron. There will be an NPC ahead of you, this is Kotaro, who has been left behind. You can ask him why he is crying, he knows he was left behind but does not remember by who. He tells you that he must find a pure white flower. You need to find the White Pinwheel item and come back to him. See the Kotaro page for details on possible outcomes of this quest. Down from Kotaro, a monk is praying by a broken bridge. Kill him to earn 87XP and 35 Sen, these monk enemies have a chance to drop Ako's Sugar. From this location, you'll be able to see some items in the lower area. Also on that level, you will see a Senpou Assassin to take on. He gives you 93XP and you can get the nearby 2x Spirit Emblem. The items under the bridge are 1x Gachiin's Sugar and 1x Mibu Balloon of Spirit. You will need to finish off the boss of this level then talk to the Old Woman, the Blackhat Badger, and come back here if you want all to progress. You CANNOT finish this until you have completed Sunken Valley but if you want you can progress Blackhat Badger quest. Equip Puppeteer Ninjutsu, then approach the Senpou Assassin in stealth and quickly press R1 to make it into your puppet. The enemy will raise the kite for you. Talk to Blackhat Badger then go back to the large tree near the Old Woman and you'll be able to grapple to the kite. Blackhat Badger will move here after Ashina Castle. If he doesn't, go buy all of his inventory at Ashina and come back. His shop is now closed, and he's interested in the Kite device to get across. You'll use this later. Grapple back up and head up the slope toward some stone lanterns. You should kill all the monks in this area to loot it thoroughly. Most can be done from stealth if you're patient, but be mindful that they travel in groups past the torii gate. You can use Ceramic Shard to separate them or stealth one and fight the rest. The ones with staves do thrust-move Perilous Attacks. There's 1x Light Coin Purse on top of the Ni-Oh gate. Now go right from the gate and into the tall grass. You'll be able to ambush some patrolling monks on a path ahead. Loot 1x Ako's Sugar from near the main path, then continue right toward 4x Spirit Emblem. After getting them, drop down one ledge to obtain 1x Light Coin Purse, 3x Antidote Powder. From this location, look up and you'll see a grapple point. This will take you to 1x Heavy Coin Purse. Return to the Ni-Oh gate and go left instead, you'll see 2x Mibu Possession Balloon to the left of the staircase ahead of the gate. Go up and stick to the left side to avoid the enemy cluster, and pick up 1x Pellet. From here grapple to a higher ledge and pick up 1x Pacifying Agent. Ahead of you, there are two guards. Sneak behind them to obtain 1x Fistful of Ash. From here, look up to find a grapple point leading to an opening on the ceiling. Go inside and defeat several Crickets, then pick up 1x Ako's Sugar. The room ahead has 4 monks and more Cricket. After you engage them, you'll face a Hammer Monk. Shuriken is useful for some chip damage, but it's best to wait for his heavier attack and go in when he's down. He'll net you 154XP. The other enemy is clad in white and will puke a rot essence that makes the crickets more aggressive. Pick up 1x Gourd Seed from in front of it, and 1x Lump of Fat Wax from behind the shrine. This room also contains 1x Gokan's Sugar and 4x Ceramic Shard. Jump out the window and talk to the Old Woman, who tells you the fresh fruit will be across the cliff and beyond the cave. She asks if you have trouble and she says to bring her rice. You will find the item at the very end of this level, so go all the way of the walkthrough then come back here. Give her the rice and she thanks you. She eats, falls asleep and then tells you that you need to wind a puppet and fly a kite. This refers to the Puppeteer Ninjutsu. Go to talk to Blackhat Badger near the starting point of Senpou Temple and tell him you have an idea. You will use the "rat" by the kite and your Ninjutsu. 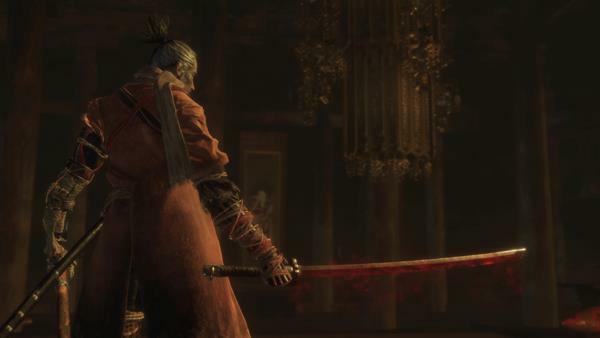 You need to backstab the rat, then use the ninjutsu by pressing R1 after the backstab deathblow. 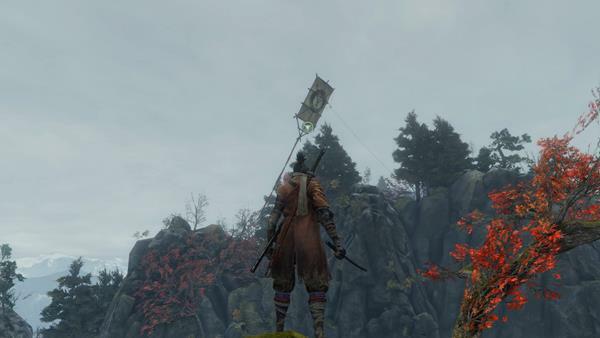 Turn around to see 1x Mibu Balloon of Spirit, then go to the other side and approach the cliff and grapple to a branch. From here look up, you'll spot 6x Spirit Emblem on a further branch. Make it all the way to the top of this maple tree to get 1x Light Coin Purse. Drop Down from the tree to stealth-kill a monk below, then return to the grassy area where a torch-wielding warrior and an archer can be found. Defeat these two and then you'll face two Senpou Battle Monks with a scythe-polearm, beware of their attacks as they deal formidable damage. You can run away and get a stealth kill if you're having trouble. Defeating one nets you 1x Heavy Coin Purse and then each gives 186XP. They can also drop Gokan's Sugar and Scrap Iron. Before moving on, make sure to pick up 1x Spirit Emblem and 1x Antidote Powder from a corner in the courtyard. Now go to the big temple on the right and around it to collect 1x Ungo's Sugar. There's a monk here you can kill if you wish. Now return to the stairs where the Senpou Battle Monks were and pick up 1x Gachiin's Sugar. You can then look to a nearby grapple point and down, you can drop onto two enemies and pick up 1x Pellet. Now grapple up to collect 2x Spirit Emblem and then into the cave, the go through it to reach the Shugendo Sculptor's Idol on the other end. Going left and down from the idol will take you to 1x Ceramic Shard and the Shugendo Memorial Mob merchant. If you look around, you'll notice that you are above the area with the Ni-Oh gate that you went through earlier. Go back to the Idol and this time head up. Grapple ahead and you'll land in front of a cave with 2x Mibu Balloon of Spirit. There are several Senpou Assassin enemies ahead, so stealth and deathblow it to earn 93XP and a chance for Scrap Iron. Then grapple to the nearby platform, stealth and kill it, and pick up 1x Gachiin's Sugar. Now grapple all the way up to get a deathblow on the last one. Keep going this way and you'll come to grappable ledges. You'll come to a clearing with an impressive view of a temple reminiscent of real-life Kyoumizudera in Japan. Grapple to the branches and across to reach safe ground, then go left to a section with many carvings with red cloth (Jizo Statues that protect children). Pick up 1x Red and White Pinwheel. From this area, you can spot some drop-down ledges. Drop as far as you can and you will see a ledge quite far down, looks like dropping will hurt. Drop anyway, as if you're aiming for the ramp nearby, and you'll get 1x Heavy Coin Purse. Heal, then use the grapple to your left and hit square to grab onto the ledge, pull yourself up and go toward a wall to wall-jump your way to a higher level. Beware of 2x Poisonous Lizard before you can jump up. Here you can pick up 1x White Pinwheel. (You can return this to Kotaro. Give him the white pinwheel and he asks him to spirit him away since he knows you're a shinobi. He says he has to go to the children). Jump across the cliff, kill the lizard, and head up the ramp. Use the grapples to access a room and loot 1x Monkey Booze and 1x Heavy Coin Purse. Then open the sealed door and defeat 1 centipede enemy, then loot 1x Black gunpowder. Commune with Bell Demon's Temple Sculptor's Idol to unlock it. 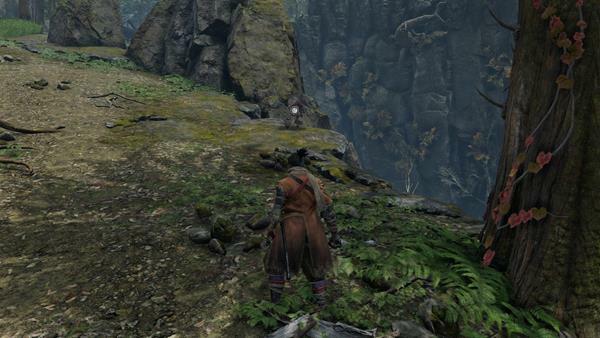 A nearby Hidden Wall: Leads to Headless and Ashina Outskirts. You can now teleport to the Shugendo Idol to continue the Temple level. The bridge near the Red and White Pinwheel has the mini-boss: Armored Warrior fight. Defeating him gives you 465 XP, 1x Prayer Bead and the Skill Breath of Nature: Shadow. Across the bridge, there's 1x Scrap Magnetite and the Temple Grounds Sculptor's Idol to commune with. Go behind the idol and drop down to a rooftop ahead to collect 1x Ceramic Shard. On the pond ahead there are 2x Treasure Carp enemies to defeat and earn Treasure Carp Scale. Grapple back out and there will be some more wolves and 1x Gokan's Sugar. From the sugar, going down leads to 2 Monkey. They can drop Persimmon and are easily dealt with by throwing shurikens. Pick up 1x Pellet. More Monkeys will ambush you as you continue down, defeat them and then stealth-kill a Hammer Monk for 154XP. In this lower area, you can loot 3x Mibu Balloon of Spirit, 1x Persimmon, 2x Spirit Emblem, and 1x Heavy Coin Purse. Look across the broken bridge, ahead is the area where you fought the Senpou Battle Monks enemies! There are several "Rats" enemies here, but they are in the rooftops. Kill the one on the ground floor and pick up 1x Light Coin Purse. Then go into the room nearby to fight some monk enemies and obtain 1x Lump of Fat Wax. The central enemy in white has a special centipede effect. Leave the room and exit the courtyard toward more Jizo Statues and Pinwheels. A bonfire burns in the distance. Defeat some monks and then go further up and around a rock to stealth one large hammer-wielding monk. There's 1x Ungo's Sugar near his location and 5x Fistful of Ash on the bonfire. Before proceeding, you can engage the optional mini-boss: Long Arm Centipede Sen-Un. Take the path leading down from the bonfire: you'll face several dogs and poison lizards. Kill them all with shuriken and pick up 1x Mibu Balloon of Spirit on the way. You'll arrive at a large temple, and hear scratching sounds. You need to kill all these mini-centipede enemies and grapple to the support beams and kill the ones there too before engaging the mini-boss. The Shinobi Firecracker tool works well for it. Defeating the boss will give you 428XP, 1x Prayer Bead and 1x Yellow Gunpowder. There's also 4x Black Gunpowder and 1x Gokan's Sugar on this room. Go back to the area with the big fire, and stealth upwards until you find 2 monks. Defeat the shield-bearer first from stealth, and engage the firebomb one at close range to defeat him quickly. There's one more enemy and 1x Gokan's Sugar on a ledge to the left of the lantern path up. Grapple onto a rooftop ahead and you'll see two more monks on the next staircase. Under that staircase, there's 1x Ungo's Sugar. Defeat the monks and continue to find 3x Senpou Battle Monks. These can be difficult so it's best to lure one out and try and get a stealth kill. You will get 1x Bulging Coin Purse. After defeating the Senpou Battle Monks, open the door and step inside the temple to commune with the Main Hall Sculptor's Idol. This room has 1x Ungo's Sugar by one of the Centipede Monk mobs, 1 x Lump of Fat Wax behind the Buddha main altar, and 1x Pellet by a Cricket Monk on the right side. You can grapple onto the beams and jump on the Buddha to pick up 1x Dragon's Blood Droplet. IF YOU HAVEN'T TALKED TO KURO AT ASHINA CASTLE YET: Talk to the NPC here to hear someone talk about the "Child of the Sacred Water", and say she must be lonely. Ask about the "special holy person", you will be told she's confined to the Inner Sanctum. He asks if you're a Shinobi and says he has a favor to ask of you. He says to atone, he wants you to give her this item. Obtain 1x Holy Chapter: Infested. If you talk to him again he recognizes you as the shinobi of the Divine Heir and tells you not to leave him alone, as you'll only know regret after losing him. If he isn't here, you can get the infested chapter from the pond near Temple Grounds: dive there after finishing Mibu Village. 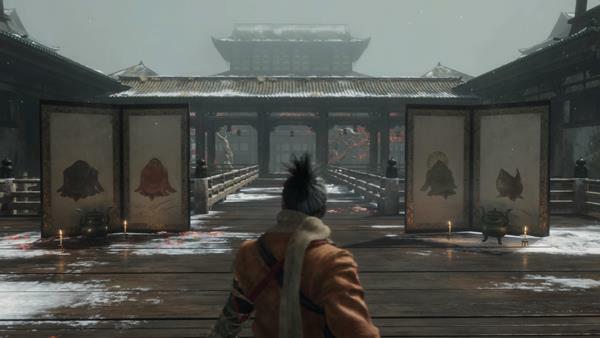 After you speak to Kuro: the Divine Heir at Ashina Castle, coming here will have a small bell that you can ring, and it will trigger a cutscene that takes Sekiro away. You obtain 1x Illusive Hall Bell which is a Quick Item that returns Monkeys and Wolves to their initial states. You are now in the Halls of Illusion. White Kimono Monkey: He's Invisible, lands near you making noise. He tells you he does not want to leave as it seems as close to Nirvana in its own way. He said someone else like you had come with a similar mission but seems to have gone quiet. He prays you might succeed in your quest. You must now set off to find the Folding Screen Monkeys without being noticed. If you screw up, you can reset with the Illusive Hall Bell. You can use the Deafening Bell nearby to cover your tracks, as well as the water in the "Roaring Hall". The Light Hall will turn dark if you let the wind in. You will need to use Gachiin's Sugar to suppress your presence and be mindful that the monkeys inflict Terror Status Abnormality. Use your Shuriken to deal with them and use Pacifying Agent as needed. When you're ready to defeat the White Robe Monkey, look for his Yellow Prints and move around the area attacking. Alternatively, use Shinobi Firecracker to get it. Defeating them gives you 3000 XP, Unlocks the Trophy: Folding Screen Monkeys, and takes you to the Inner Sanctum. You also get Memory: Screen Monkeys and the Puppeteer Ninjutsu. Behind the Inner Sanctum building, you can find 2x Pellet. Within, approach the Divine Child of Rejuvenation and ask for the Fushigiri Mortal Blade, and you will be warned that none who draw this weapon survive. You have an option to try anyway or give up. As you draw the blade, you die but revive. She mentions you carry the curse of the Dragon Heritage. Talking to her again, she asks why you seek the blade. You reply that you wish to sever the Dragon's Heritage. She is the only surviving member of the children of the Rejuvenating Waters. She decides to help you and gives you 1x Rice. After this, you can interact with her for several different results. Leave the Inner Sanctum by opening the door to the left of the entrance, and you'll be back at the Main Hall. Here, you can now defeat the Centipede Monks by using the Mortal Blade (It's a Combat Arts so make sure to equip it). 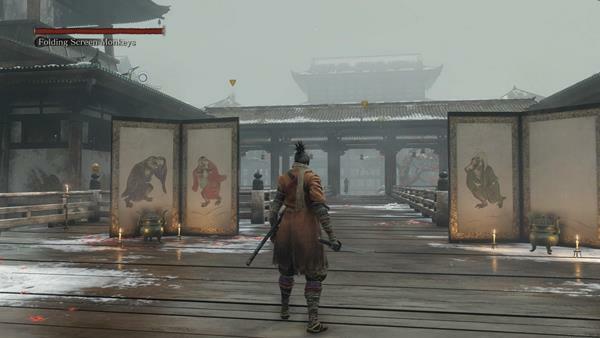 From here you can return to Ashina Castle to talk to Kuro and show him the blade for some dialogue. Exit from the far door and drop to a ledge to pick up 1x Ako's Sugar before going into the building with the white banner. Defeat 1 monk and continue down past a Buddha Hall into a cave. You'll be attacked by Centipede Man, kill them in close range battle. Look left and you will spot a small passage you can crouch through. This takes you to an opportunity to stealth-kill a would-be ambusher. Press on and enter another narrow passage, this time with water. Pick up 1x Mibu Balloon of Spirit and go up a ledge to face 3 Centipede Man in a cave filled with dead monks. Grapple up twice and you'll emerge to a Pagoda. Defeat 2 Poisonous Lizards and Pick up 2x Pellet and 2x Spirit Emblem. 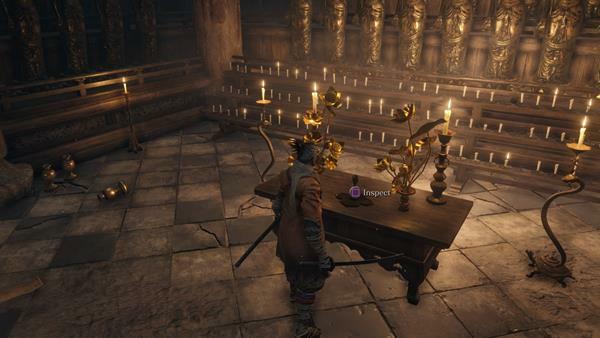 Inside the Pagoda, you'll find the Senpou Esoteric Text, that unlocks Temple Arts Skill Tree. You can now use the nearby Grapple point to get back to the temple main hall. Drop into the pond near the "Temple Grounds" Idol and dive towards a Kannon Buddha to get 1x Prayer Bead. 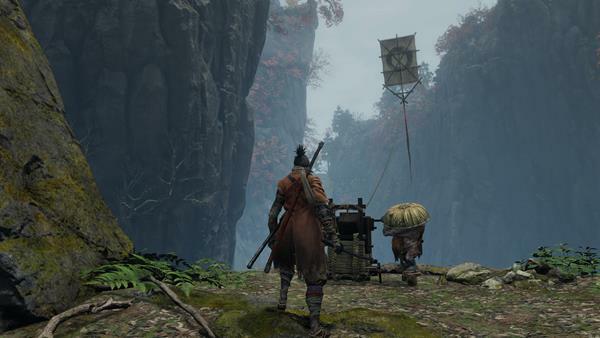 • Mount Kongo is the only real-world location named and visited in Sekiro, and its placement implies that the Ashina territory lies somewhere in the Nara or Wakayama highlands south of Osaka. In the main temple, how to open the “door does not open from this side”? Or is it just for show? there&apos;s a bundled jizo statue in the main hall, if your&apos;e looking at the great buddha with the dragon blood droplet, the bundled jizo statue is to the left in the smaller statues, you have to grapple up to see it. Using the Mortal Blade: Just wanted to mention (and in case site wants to include it when mentioning using it) you do NOT have to equip the Combat Art, which costs spirit emblems to use. After killing/getting deathblow on infested priests another deathblow red icon will appear on them b4 they resurrect. This will use the Mortal Blade to kill them without using emblems and the Combat Art. The NPC wasn&apos;t there for me, either, but it didn&apos;t hinder my progress through the area. No NPC there for me, wtf? The npc at the top doesnt talk to me. no idea what to do.